In the evening, as a polling party took off from Orccha in Narayanpur, a small action team of Maoists attacked security personnel, the Chhattisgarh police said. In police retaliation, an alleged Maoist was killed. 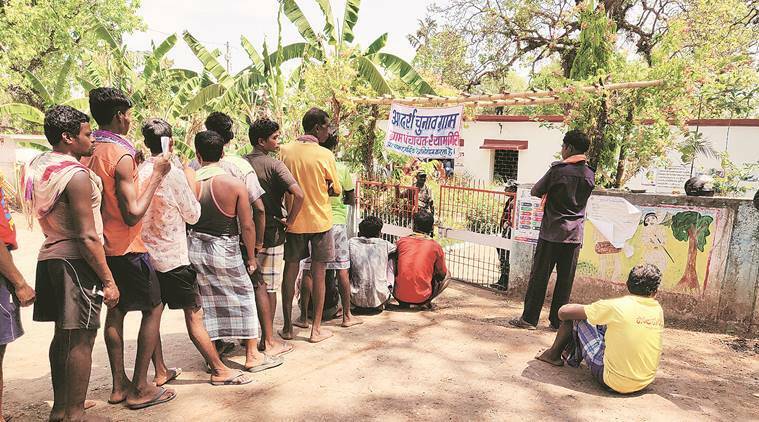 Naxal-hit Bastar, that went to polls two days after MLA Bhima Mandavi was killed in an attack, witnessed 57 per cent voter turnout till 5 pm. Fear gripped voters in the Parliamentary constituency, but people came out in large numbers despite many an incident aimed at creating panic. At 4.30 am, as a polling party made its way near Farasgaon in Narayanpur district, a low intensity blast attempted to target them, but there were no injuries. Two hours later, four Maoists, allegedly armed, were arrested in Bijapur. There were rumours of a “blast” in later turned out to be a cracker. Later in the evening, as a polling party took off from Orccha in Narayanpur, a small action team of Maoists attacked security personnel, the Chhattisgarh police said. In police retaliation, an alleged Maoist was killed. Overall though, senior officials said, they were encouraged by how the day passed. Voting percentage, they said, was set to rise from 59 per cent that Bastar polled in 2014. “It is likely to cross that mark despite the blast that killed Mandavi and the four policemen. The final data will be confirmed late after all polling parties return. But in Bijapur, for instance, which was 33 per cent last time, it is already above 40 per cent,” an official said. The signs of conflict are everywhere. The first is the log, thrown purposefully across the thin, tarred road. It is a warning. The road ahead, doesn’t exist, for there is a crater the size of a vehicle in the middle. There is a makeshift diversion, through a field, to the right of the crater. The tracks on the earth have flattened some of the evidence. The BJP posters are covered in dirt as are a shoe, the headrest from a car, and bloodstains. Less than two kilometres further down the road, with a dirt track leading though, is the Shyamgiri private school. Outside the school, between 7 am and 3 pm on Thursday, was a row of people. Some wearing no slippers, some sitting on their haunches. But each with a voter slip, and a conviction. Like 51-year old Narsingh. Two days ago, the day campaigning ended for the Bastar Lok Sabha seat, the village of Shyamgiri shook with the sounds of an explosion, and then a burst of fire. In the next hour, police personnel swarmed the area. Bhima Mandavi, the lone BJP MLA had been killed with four other policemen in an IED blast triggered by Maoists. The next morning, Narsingh said, the village had many conversations. Some within closed doors, others in groups. “We spoke whether we should vote. Whether it was safe. But this is Bastar, and this happens here all the time. Our daily lives don’t stop. So why should we stop voting,” he said, showing off his ink stained hand. Outside the gate of the Shyamgiri school, there was a queue, people let in only in small groups, with CRPF personnel all around. For one 25-year old, the best way to honour Bhima Mandavi, was to vote as if he never died. “I think the best way to pay our respects, is to vote for issues, and not sympathy. To vote for who we think will bring change and progress. And to vote in high numbers,” he said. Shyamgiri seemed to respond to the call. The polling station had two polling booths. One for the village of Shyamgiri, and the other for the village of Kutaipal, deemed too dangerous for a booth at the village, and thus shifted to Shyamgiri. These two stations accounted for 920 votes. By 10:30 am, 410 had already been cast. By evening, senior officials said voting percentage had crossed 70 per cent.